Launched in May 2015 our (Aguaconsult, WaterAid, Water For People and IRC's) Agenda for Change is intended as a forward looking statement of intent. It sets out what we think we need to do and how we need to act so that everyone, everywhere can use water, sanitation and hygiene (WASH) services that last forever. 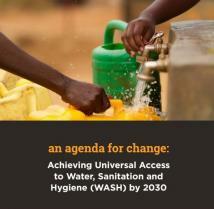 A set of principles to guide our actions in the years to 2030 (end date for achieving universal access to WASH). The way of seeing the world and of doing our work that is set out in these principles has emerged over the last decade, and it says a lot about how the WASH sector itself has changed that four organisations with such different starting points have come to such similar conclusions about what needs to be done. For IRC these principles are fully aligned to how we see the world of WASH and our role in it and we are wholly committed to implementing them across our programmes. Our Agenda for Change sets out what we think we need to do and how we need to act so that everyone, everywhere can use water, sanitation and hygiene services that last forever. Most striking, we think, is that three Non Governmental Organisations (NGOs) see Government as being so central to solving the WASH challenge – and identify our own role as being to do all we can to support Governments (both national and local). Given the long history of NGOs opposing – or presenting themselves as alternatives to – government, we think this is hugely significant more so because we find so much resonance with this way of thinking outside our own organisations. We intend to bind our own actions, individually and collectively by these principles. We also intend to share them widely and encourage others (especially fellow NGOs) to adopt and adapt them. We welcome comment and criticism of them, as we believe that it is only through collective adoption of this way of working that we will in the end achieve the objective to which we are all committed. You can download the principles paper with our Agenda for Change below. Pages: 6 p. : 1 box, photogr.